Titles expire around the same time of day that they were borrowed. So, if you borrow a book at 12:30 PM, it will expire around 12:30 PM on the last day of its lending period. 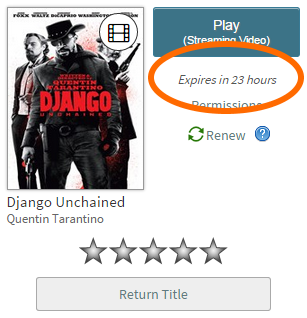 To see when titles will expire, select in your library's digital collection to go to your Loans page. You'll see the time left in your lending period above each title. 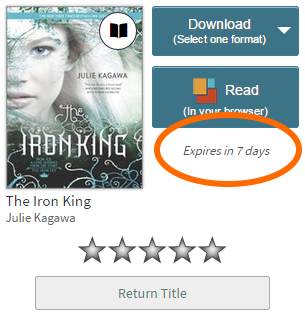 Or, if you've downloaded the title to the OverDrive app (Android, Chromebook, iOS, or Windows 8 and up), you can see when the title expires on your app bookshelf. If you find that titles expire before you can finish them (or you finish them early in the lending period), you may be able to choose a different lending period. 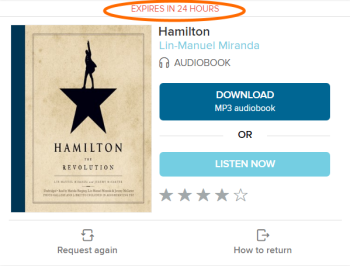 To see when titles will expire, log into your library's OverDrive website and go to your Checkouts page (under your Account). You'll see the time left in your lending period next to each title. Or, if you've downloaded the title to the OverDrive app (Android, Chromebook, iOS, or Windows 8 and up), you can see when a title expires on your app bookshelf. If you find that titles expire before you can finish them (or you finish them early in the lending period), you may be able to change the default lending period for some digital formats. In most cases, you can also return titles before the end of their lending periods.